A beautiful summer berry pavlova made from pastel pink pavlova discs, lashings of softly whipped cream, dressed with a dash of blackcurrant cassis and topped with oodles of summer berries. 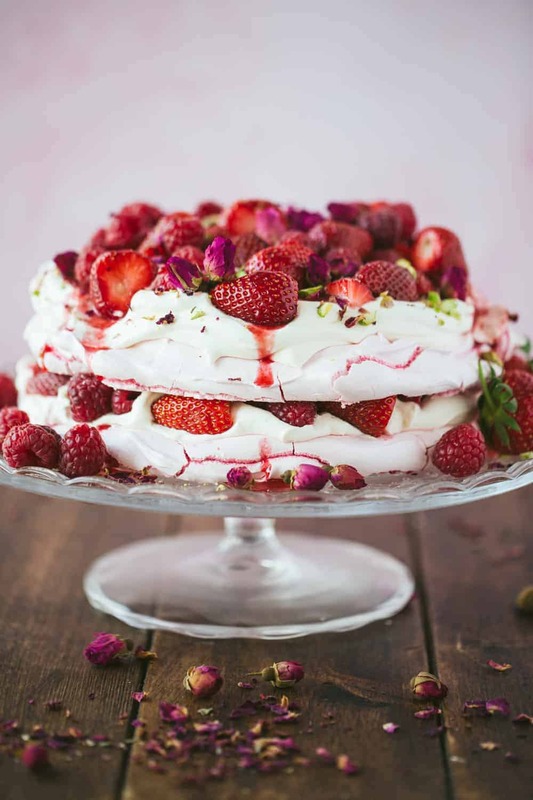 This gorgeous pavlova is heaven on a plate. 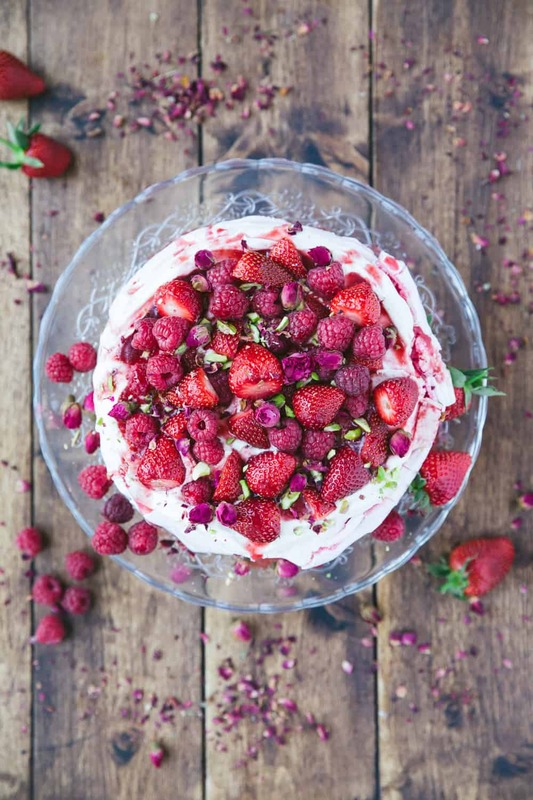 For this recipe, you will need: eggs, caster sugar, pink powder food colouring (optional), double cream, strawberries, raspberries, blackcurrant cassis (optional), pistachios and dried roses to decorate (both optional). The moment the sun starts shining and I can smell fresh sweet strawberries as I walk around the greengrocers, I know it’s time for a pavlova. 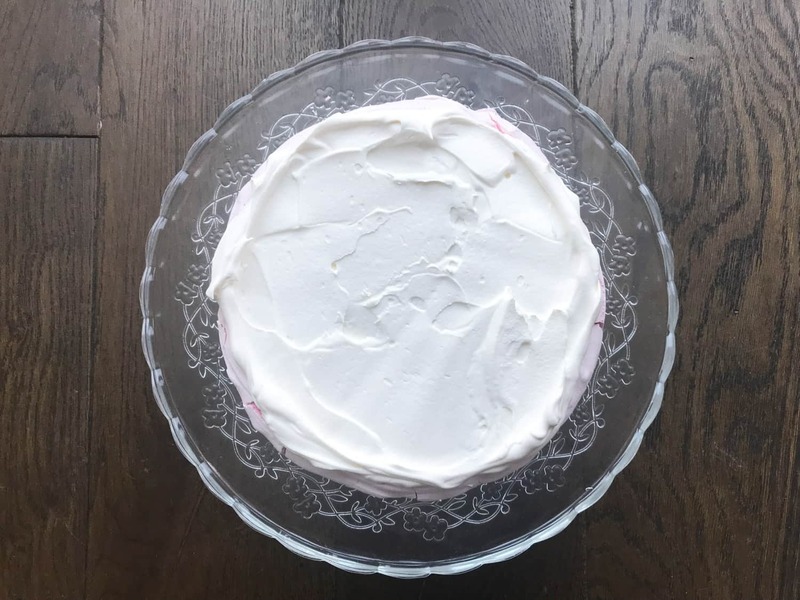 This is one of my favourite desserts to bake because it’s so simple and easy yet results in the prettiest showstopper to adorn your dinner table. 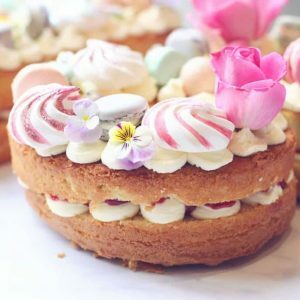 Getting meringue right can seem a little overwhelming if you’ve never made it before but I promise if you follow the steps in the recipe yours will turn out perfectly every single time. There are three main types of meringue, for this recipe we will be using the Italian meringue method. Italian meringue is when the sugar is heated before being whisked into egg whites. Making meringue this way ensures the meringue discs will have structure, stay crisp on the outside with a slightly chewy centre. 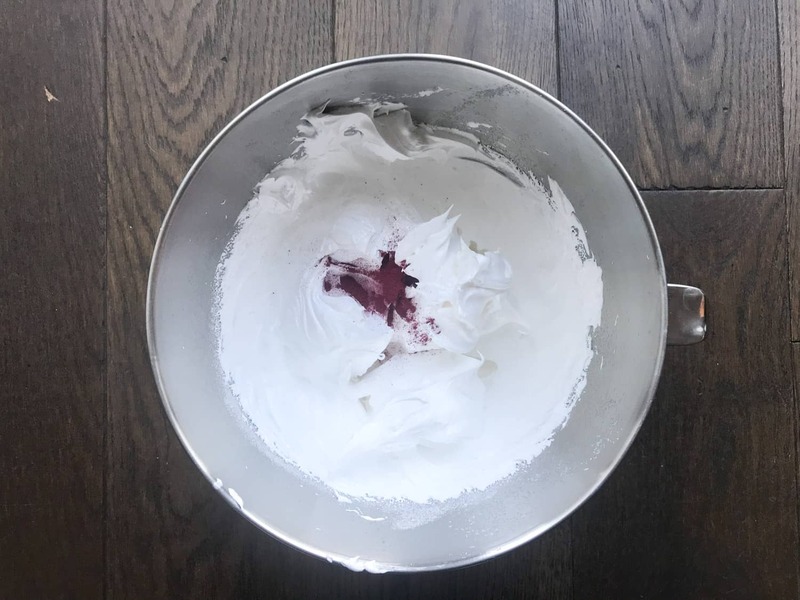 I split my meringue mixture and made two discs to add some height to my pavlova and also so I could slip in an extra layer of cream and fruit. You could just make one disc if you wanted to so you end up with a plump fuller meringue base on which to sit the cream and fruit on top. Either way, the proportions of the recipe remain the same. I also decided to colour my meringue a soft pink pastel colour using powdered food colouring (affiliate link) to compliment the berries. This step is totally optional as is adding blackcurrant cassis to the strawberry sauce. 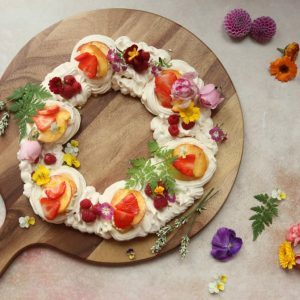 You don’t *need* pistachio slithers or rosebuds to decorate but your summer berry pavlova will look extra pretty and presentable if you do decide to add them! What makes this summer berry pavlova such a good dessert? It’s a great choice for feeding a crowd of people and a good alternative to a chocolate dessert. You can use any fruit topping you like. It’s quick and very easy to make. It’s an all-around crowd pleaser and will appeal to most tastes. It’s a real showstopper of a dessert! It tastes A-M-A-Z-I-N-G need I say more? How long does pavlova keep for? 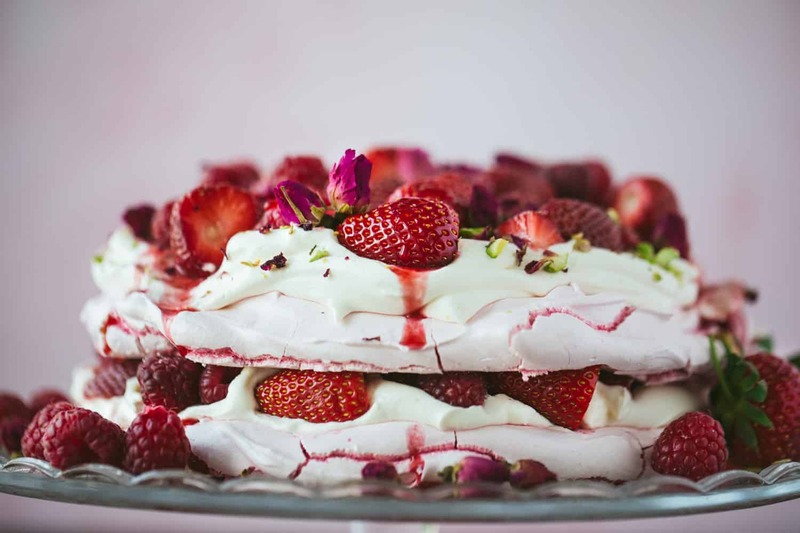 A summer berry pavlova is best made and eaten on the same day, however, it can be frozen and then defrosted for a couple of hours before serving. Once you’ve added sauce, cream and strawberries the meringue will lose it’s crispness and will start to go very soft if it’s left out for longer than a few hours. 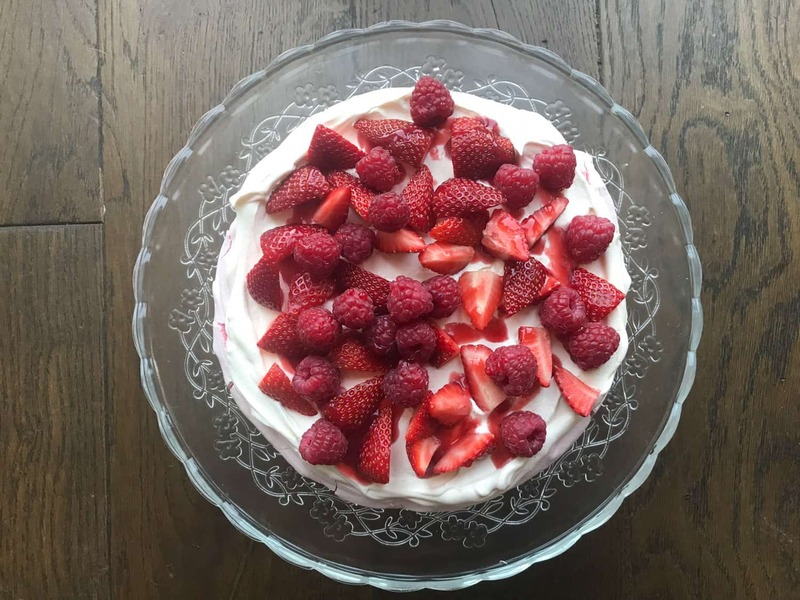 So be mindful that if you’re making this for a gathering it’s best to add the sauce, cream and fruit at the last minute so that the meringue stays crisp on the outside and chewy in the centre. 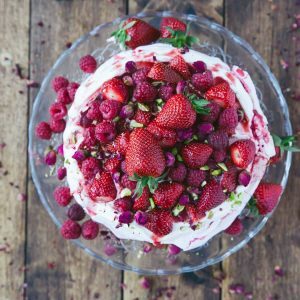 It’s unlikely that you’ll have any leftovers but if you do it turns into more of a summer berry Eton mess as opposed to a pavlova. It will still taste amazing but the consistency of the meringue will change. No berries? No problem. Below is a list of alternative pavlova toppings. 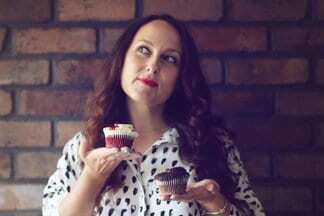 Once you’ve mastered the art of meringue making then you can make any pavlova you can dream up! Preheat your oven to 200ºC/180ºC Fan/Gas 7. 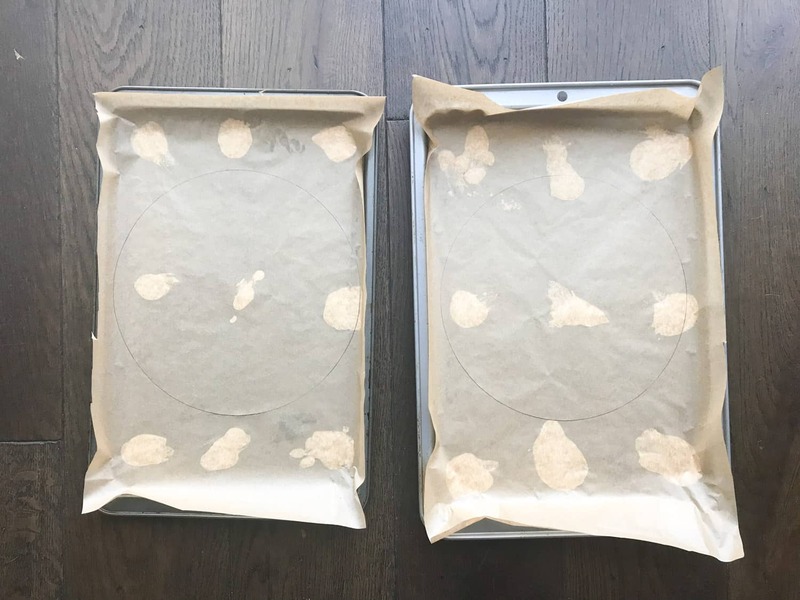 Line a baking tray with baking paper and add 300g of caster (superfine – US) sugar. Heat in the oven for 7 minutes. Meanwhile, measure 150g of egg whites in a mixing bowl and whisk to soft peaks using a mixer or handheld electric whisk. Whisk slowly to begin with then increase the speed to medium until soft peaks form – about 5 minutes. By now your sugar will be hot so you can remove it from the oven and add it to the whisked egg whites a spoonful at a time. Keep whisking until the mixture is thick, glossy and bright white – about 7-9 minutes. Meanwhile, turn your oven down to 100ºC/80ºC Fan/Gas 1/2. You can check the mixture is done and all the sugar has dissolved by rubbing some of the mixture between your fingers. If you can feel any grain, continue to whisk for a couple more minutes until it feels completely smooth. At this point, you can add a teaspoon of pink powder food colouring if you want to. Mix until you have a soft pink effect. Trace a circle smaller than your cake stand on two pieces of baking paper. Stick the baking paper to a baking tray using a few dots of meringue mixture. 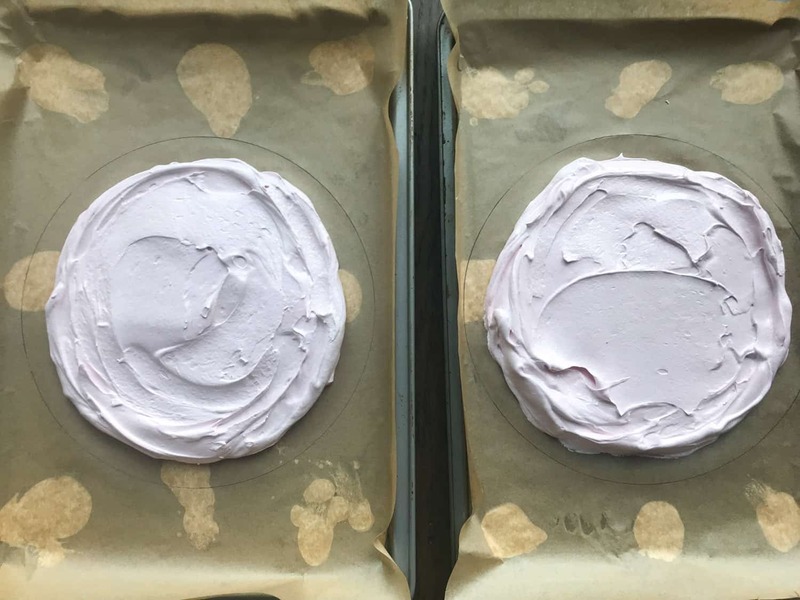 Split the meringue mixture evenly onto the baking trays using the circles as a guide. The meringue will spread slightly in the oven but not much. 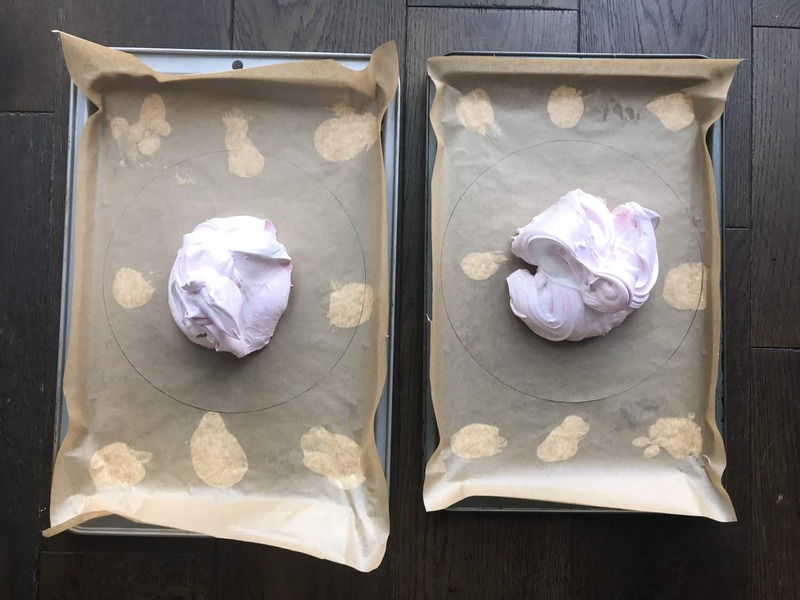 Put the baking trays in the oven and bake for about an hour or until the meringue discs can be easily lifted away from the baking paper without cracking. Once baked, switch off the oven and leave the door open until the meringues are cool. Don’t be tempted to take them out and remove them from the trays too early or they will crack! While the meringues are cooling cut 100g of strawberries into small pieces and crush them with the back of a fork. 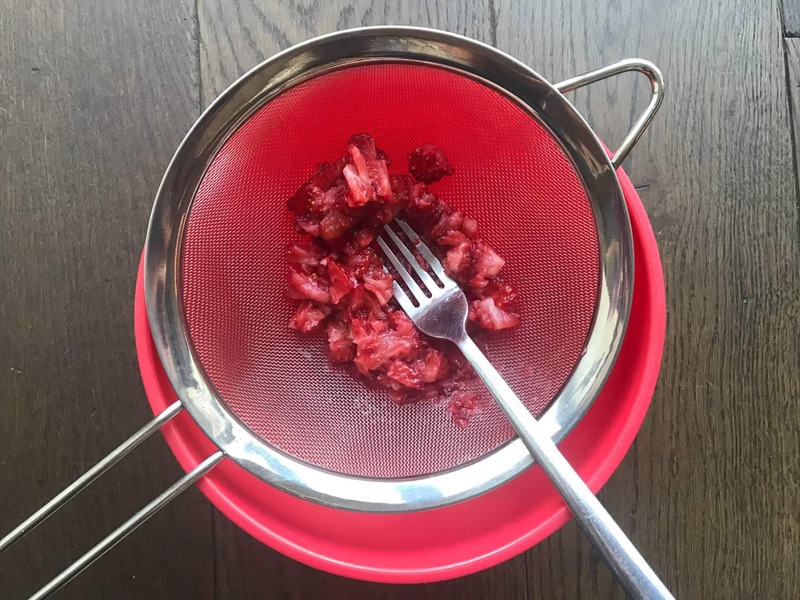 Transfer them to a sieve and run the back of the fork over the crushed strawberries to get the juice out. Add 2 tablespoons of blackcurrant cassis to the strawberries and add caster sugar to taste (about 2 teaspoons). If you don’t have any blackcurrant cassis just add a tablespoon of water. Whip 500ml of double cream until it has only just thickened. The cream should be soft and pillowy but not so thin it runs off a spoon. Do the drop test by picking up a spoonful and dropping it back into the bowl. If it plops gently it’s whisked just right. Set a few whole strawberries aside and cut the remaining strawberries into quarters. When the meringue discs are cool, spread the first disc with cream, add a drizzle of strawberry sauce and top with half the strawberries and raspberries. Add the next meringue disc on top and repeat with cream and sauce. Pile the remaining fruit on top and finish with slithers of pistachios and a few dried rosebuds if desired. 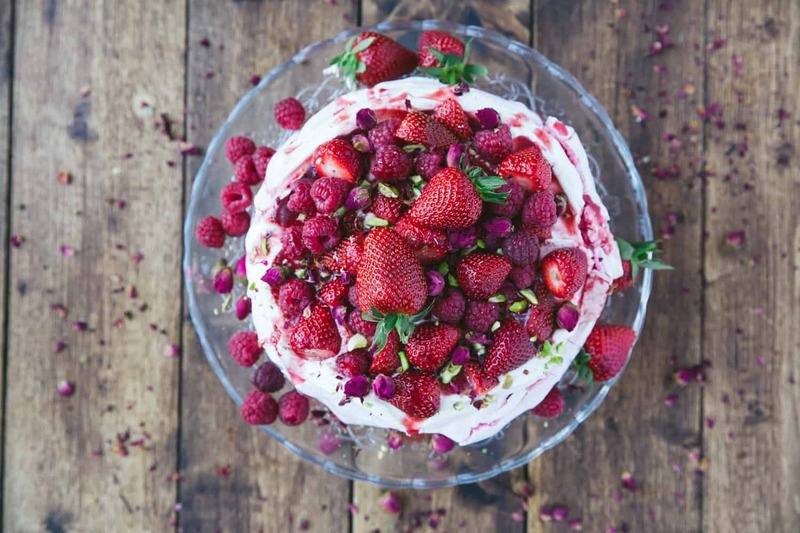 I hope you enjoy making and eating this summer berry pavlova as much as I do! It really is the epitome of sunny days for me and such a crowd pleaser. A beautiful summer berry pavlova made with pastel pink meringue discs, lashings of whipped cream, topped with blackcurrant cassis sauce and piled high with summer berries. Perfect for get-togethers in the sun. By now your sugar will be hot so you can remove it from the oven and add it to the whisked egg whites a spoonful at a time.Keep whisking until the mixture is thick, glossy and bright white – about 7-9 minutes. At this point, you can add a teaspoon of pink powder food colouring if you want to. 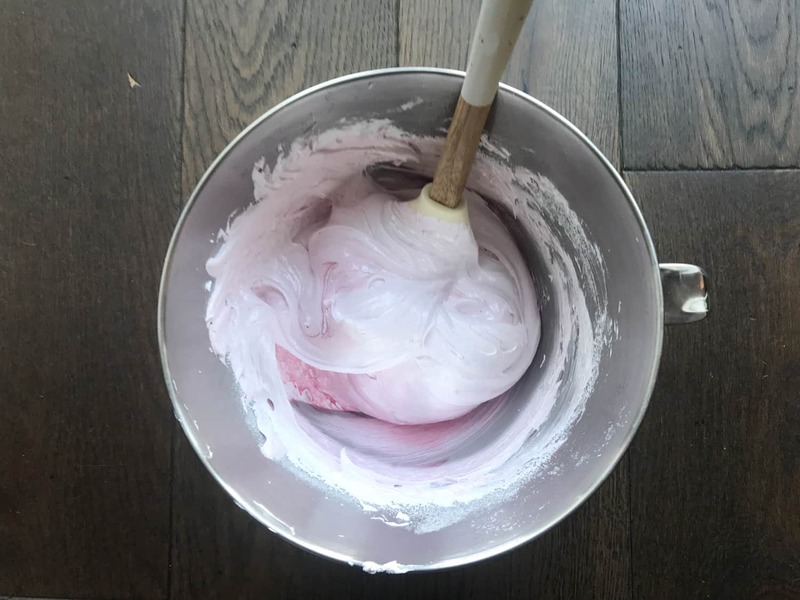 Mix into the meringue until you have a soft pink effect. Trace a circle smaller than your cake stand on two pieces of baking paper. Stick the baking paper to a baking tray using a few dots of meringue mixture. Once baked, switch off the oven and leave the door open until the meringues are cool. Don't be tempted to take them out and remove them from the trays too early or they will crack! Add 2 tablespoons of blackcurrant cassis to the strawberries and add caster sugar to taste (about 2 teaspoons). If you don't have any blackcurrant cassis just add a tablespoon of water. Whip 500ml of double cream until it has only just thickened. 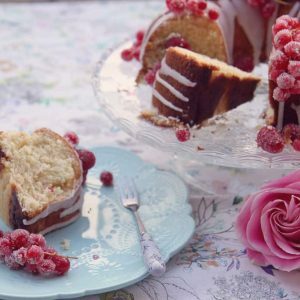 The cream should be soft and pillowy but not so thin it runs off a spoon. Do the drop test by picking up a spoonful and dropping it back into the bowl. If it plops gently it's whisked just right. Set a few whole strawberries aside and cut the remaining strawberries into quarters. When the meringue discs are cool, spread the first disc with cream, add a drizzle of strawberry sauce and top with half the strawberries and raspberries. Add the next meringue disc on top and repeat with cream and sauce. Pile the remaining fruit on top and finish with slithers of pistachios and a few dried rosebuds if desired. Do not remove the meringue discs from the oven until they are cool. This will prevent cracking. The meringue discs can be baked in advance of assembling the pavlova and will keep in an air-tight container for 5 days. 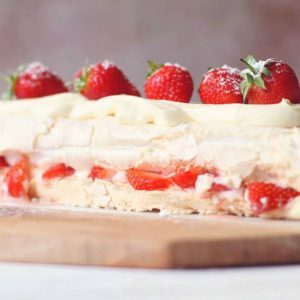 Remember this dessert will lose the crisp meringue consistency if it's left out for longer than a few hours so I recommend adding the cream, sauce and fruit just prior to serving. This dessert can be assembled and then frozen for 1 month. Defrost for a couple of hours at room temperature before serving. Any leftovers can be turned into Eton mess! 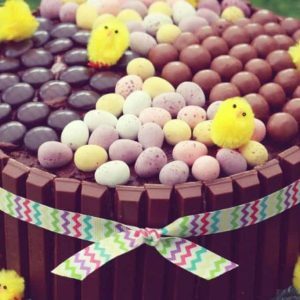 Previous Post: « Easter Chocolate Poke Cake With A Hidden Surprise!